farc provided assistance to the families from this fire in newark. we have already provided replacement furniture and other household furnishings to three of the families from this fire. FARC delivered a 15 ft. truckload to a Hurricane Maria family who relocated to Newark from Puerto Rico. We provided furniture for three bedrooms, in addition to, several small appliances, pots. pans, dishes, microwave, lamps, pictures and many other household furnishing. A special THANK YOU! To our friends and partners at the JACK & JILL organization of New Jersey for their donation of Holiday Care package. These packages were distributed during the holidays to women who were recent victims of a fire. Each bag contained a gift card for $25 in addition to those essential grooming items every woman needs to start her day. 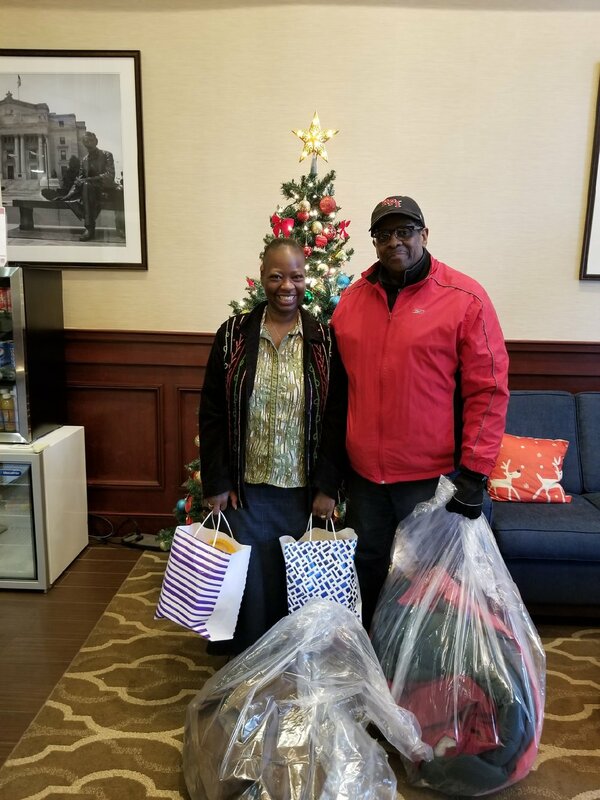 FARC delivered two bags of winter coats to a family at the Comfort Suite Inn in Newark. The family was displaced by a fire two days before Christmas. The gift bags in this picture was donated by Friends of FARC, Ellen and Wendell Maddrey.